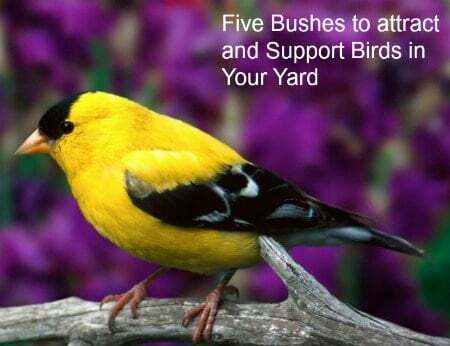 Five Bushes To Attract and Support Birds In Your Yard. Provide food and habitat for your local birds. Plant bushes they love! Dave and I live in bird heaven. 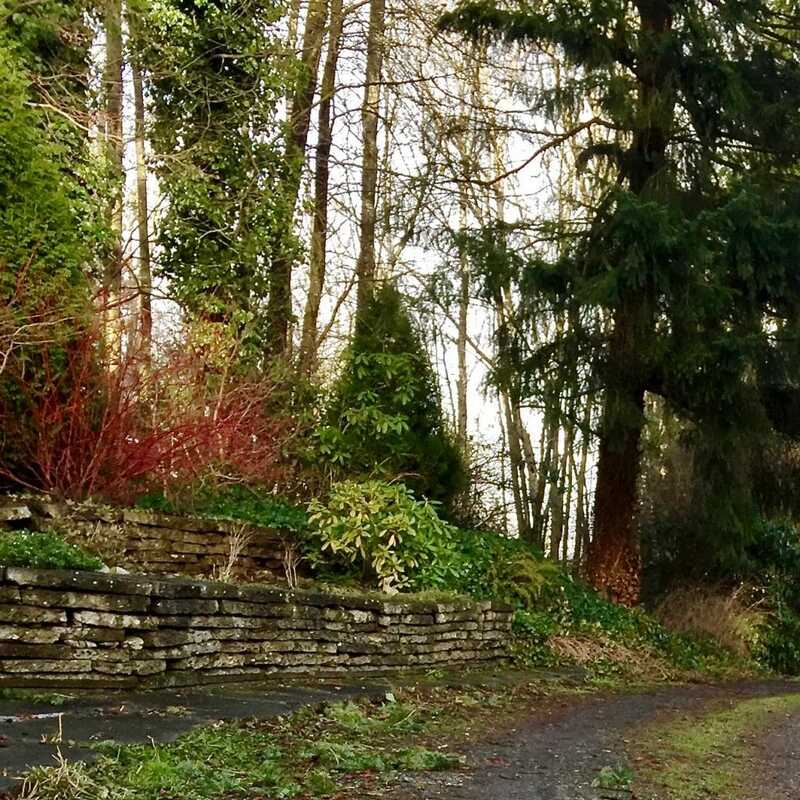 Hundreds of acres of deciduous and evergreen woodlands, wetlands, fields and a large river nearby attract birds of all types to our property. Wild blackberries, native bushes and trees support our local bird population wonderfully well. Every spring we delight in hearing and seeing song birds, woodpeckers and hummingbirds of various types call to each other as they blow past us on the wind. We have larger birds of prey like owls, hawks, eagles and the Great Blue Heron too. However, wild bird habitat is dwindling as more and more woodland and wild areas are developed. Bird habitat is mightily scarce in many urban areas. Not only that, 50 percent of ALL home gardens inadvertently kill birds with the chemicals they use on their lawns! Time to get organic! Home gardeners benefit from their relationship to birds. Wild birds are predators of insects, caterpillars and slugs. Fruit loving birds can help manage over ripe fruits. They are also important pollinators as they flit from bushes, trees and plants they distribute pollen along the way. Birds offer us beauty, wonder and serenity. We need to encourage and protect them! We can all improve our gardens and support birds (who doesn’t like bird songs, a flash of wing and life?). Let’s Grow birds some habitat! Myriad Bushes produce the foods, shelter and nesting homes birds need. Planting Home gardens to support wild birds is called ‘birdscaping‘. Birdscaping benefits them and it benefits us too. This last winter was HORRIBLE! for us and our local birds. With months of snow on the ground, constant icy rain in between snow storms, and sustained deep cold, the birds at our house had had enough! We actually had birds landing by our front porch begging for food and water. That NEVER happens in our temperate woodland yard. It got me thinking. We might need to put out bird feeders and start planning out more carefully how to support our feathered friends. So…I am putting a ‘bird garden’ into my new front yard! We have a stream and pond on the north side of our house. The birds use it. but More is better right? Besides I’m addicted to the sound of water and love watching the birds land and fling water around. Another water feature is going to happen! Our pond and stream are important water source for our pollinators and birds. A stand of western Red cedars in the background are wonderful for winter bird support! 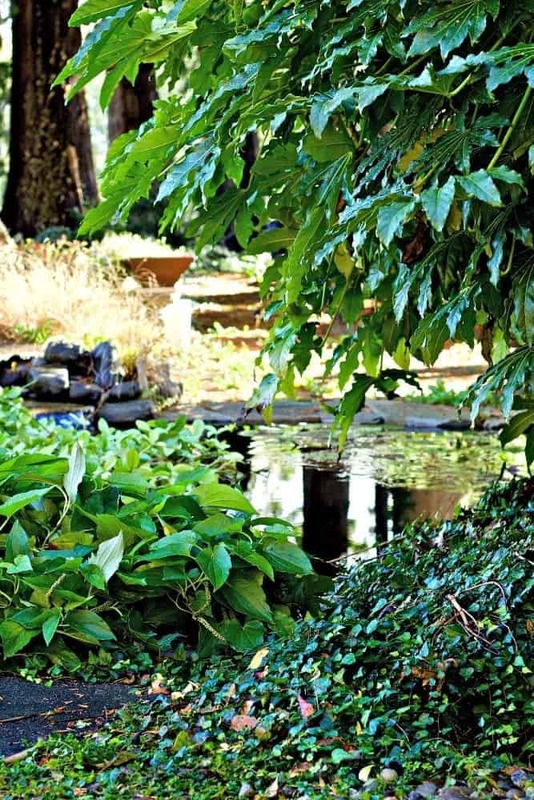 The False Aralia (Fatsia japonica) you see above the pond is a lovely shade garden evergreen. Watch the pollinators go nuts for this late Fall bloomer. We are eventually reorienting our house so the living room faces what was a boring yard of grass. (Our kids old play yard). My plan is to restructure that space (so I don’t have to mow it) with an interesting landscape containing a variety of bird attracting and supporting bushes and a water feature of some kind. Seating areas among a lovely planted area with water trickling through…birds happily alighting nearby. And less grass is always a good thing! I’ll keep you posted. Consider this step one. What shall I plant there? I found out a huge variety of bushes will work. Many I already grow 🙂 This area or our yard already has some rather neglected bird attracting bushes I discovered. A large rhody, Staghorn, volunteer elderberry and oregon grape are planted along the back already. Nice! bird attracting foliage. This mess is full of bushes birds love. Now I have to sort it all out so humans like it too! Red staghorn, holly, Oregon grape and Native elderberry are all growing back there. I’ve been whacking them back for years. Time to get smart about my bird garden. I love lots of bushes that the birds love. And many of those bushes are growing in my yard. 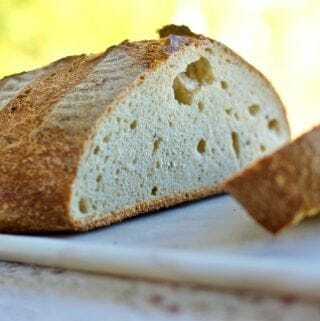 I had no idea they were bird favorites until I did the research for this post! It turns out birds love gardens full of dense bushy hedges and trees. Bushes that produce berries and bright flowers also draw them in. Certain Bushes can feed and shelter birds through winter. Junipers are important to birds! Plant some! Although ALL flowering plants will draw bees to some extent. Birds require more from a plant than just a pretty face. Birds like a bushy sheltered area to raise their young in privacy and safety in spring. They need some messy piles of yard debris to choose nesting material. They need a water source throughout the year. For Landscape value look for shrubs that provide blooms, texture, line, style, Fall leaf color and winter interest. Find your garden zone. Here’s five bushes that I grow now. They are all easy to grow bushes. All produce food and habitat for our feathered friends. My little brother almost poisoned himself on landscape bush berries at our elementary school way back when (He thought they were blueberries). That taught me to watch out for bushes with inedible berries. I choose to highlight bushes with berries edible to both people and birdies to protect our families. My mom came over several years ago with yet another car load of refugees from her friends of the library fundraiser. The PLANT sale fundraiser. They weren’t selling books. All her library friends are gardeners. 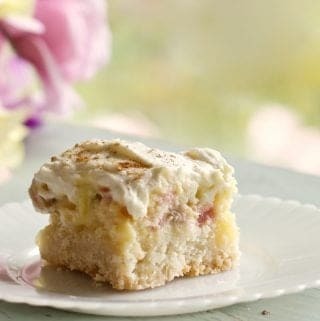 You may remember we got our rhubarb start that way too. Anyway… we were gifted with a load of planty treasures. Among them a small Red twig dogwood. What a jewel of a shrub! Red Twig Dogwood offers stunning winter color, cover and berries for the birds! This one is too big already for the spot we chose. It needs a lot more space. Our Red Twig Dogwood continues to grow and flourish these several years later. Even though we put it in the wrong(too small) spot. 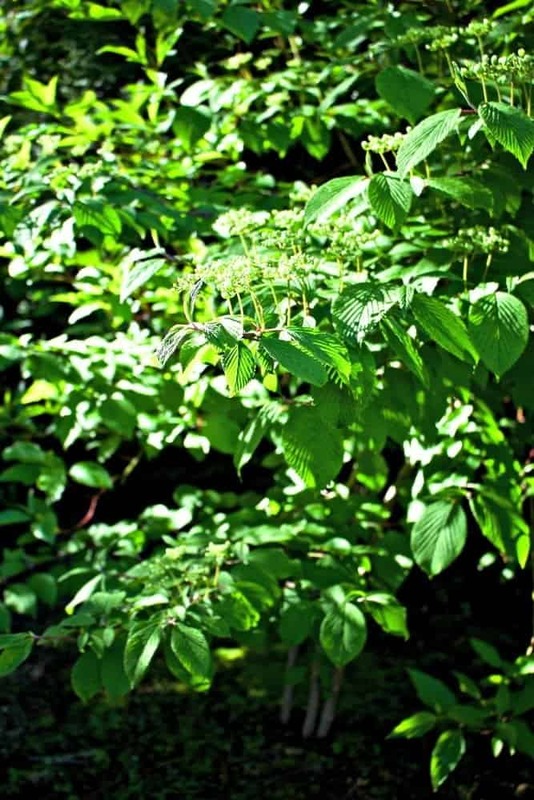 It produces a load of white flowers in the spring that produce berries that birds love and rather benign pleasant looking green leaves all summer with just a trace of red twig peaking out. And then Fall comes. Those leaves turn glorious colors and fall away from those amazing red twigs. Holy cow what a show all winter! Red Twig Dogwood in spring. The red twigs are covered with green leaves. It’s almost ready to bloom! Red and yellow Twig Dogwood are hardy from Zones 3-8. Winter and spring twig color is yellow or red, depending on variety. We have two tiny yellow twig dogwoods. Thanks to mom again! Grow as: Most often seen as small trees, but there are many species of dogwood shrubs, such as red twigged dogwood (Cornus baileyi). Berries: The berries ripen from summer to fall depending on the species and their high-fat content provides valuable nutrients for migrating songbirds in the fall. Attracts: Bluebirds and other thrushes; woodpeckers; catbirds; thrashers; mockingbirds. Blueberries. Birds love this superfruit and many other fruit too! LOTS of Birds LOVE fruit. We have pretty much donated our bing cherry tree to the local birds. Plant fruit trees and berries with local birds in mind. Leave unwanted fruits on the bush or tree for migrating birds to travel on. Blueberries reach 5 to 6 feet high and around. In fall these beauties offer leaf color to die for. Winter structure as they sleep. These really give a lot of bang for your buck! Pretty in spring when they flower. Healthy berries in high summer for you and the birds. Dave has planted about 12 blueberries on our property. If you are going to be stingy and try to keep them all for yourselves…you’ll need a net to keep the birds out. Why not plant more than you need and let the birdies have a share. 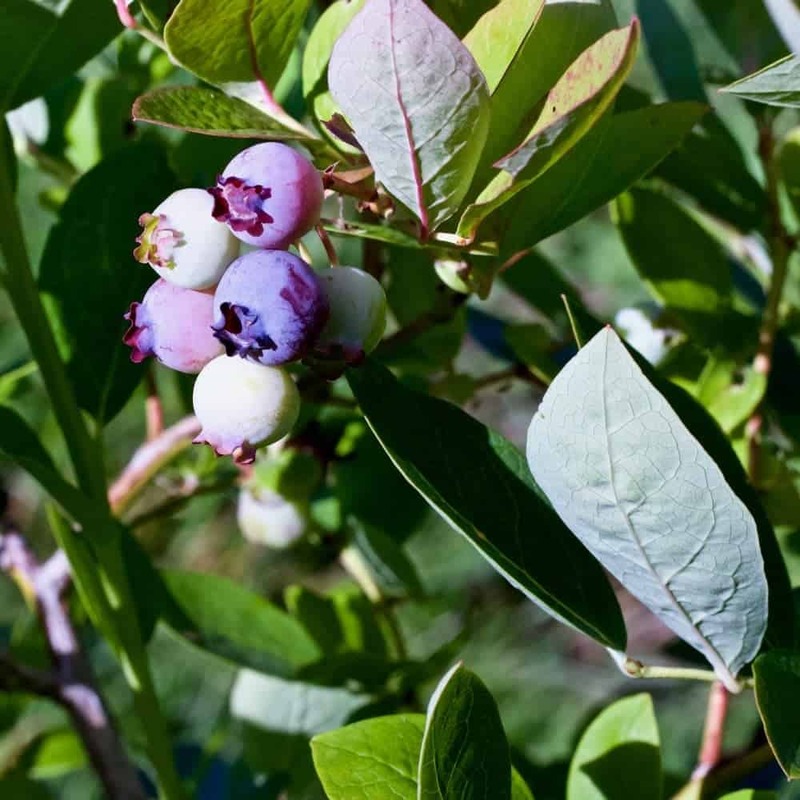 We planted several blueberries next to our tree fruit orchard. The carnivore birds eat the bad insects and larvae off our fruit trees. The fruit loving birds help us with our over ripe fruits. Happy birds, happy us! Staghorn is a REALLY cool small tree. Our old original Staghorn tree actually fell over several years ago in a big windstorm. We were sad because we loved that old tree. But a colony of young staghorns emerged from it’s roots. Happy us! Staghorns have Beautiful fall color and winter interest from the exotic branching. 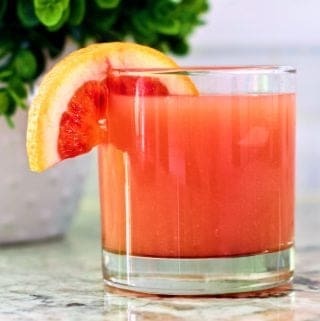 The berries can be made into juice and other parts are considered medicinal in some circles. In my research to support pollinators I found the staghorn is an excellent choice all round! 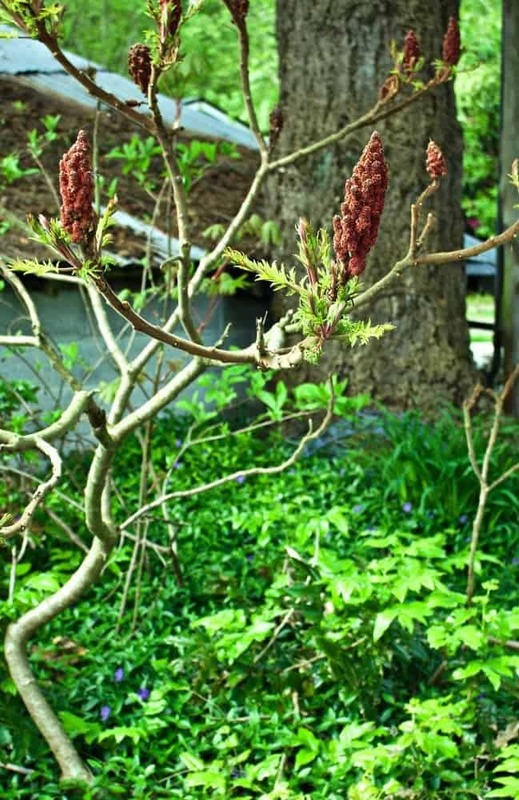 Red Staghorn-Sumac just leafing out. Last years seed pods still on the branches to support the birds.Notice the twisting crooked branches. 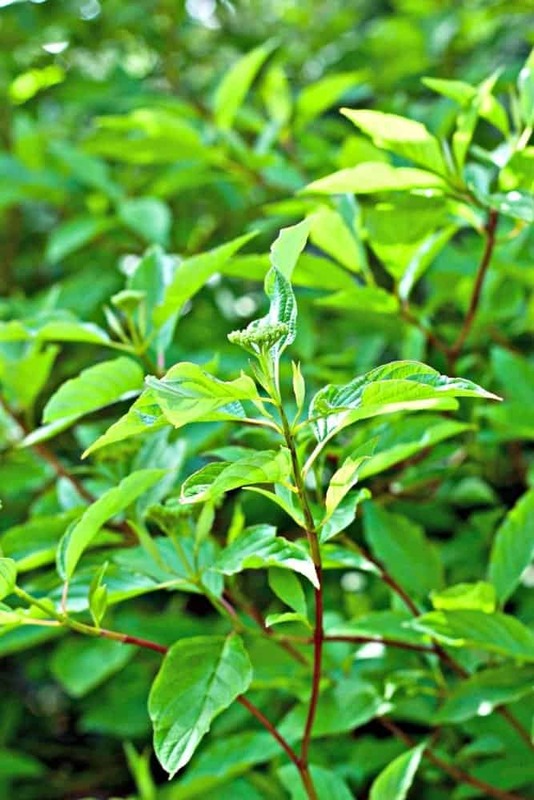 It is not to be confused with poison sumac (Toxicodendron vernix), a completely different plant. Grow as: Shrub or small tree. Berries: The berries form in spikey, dense red clusters at the terminal ends of branches and can last through winter and into spring. Attracts: Warblers; woodpeckers; chickadees; bluebirds and other thrushes; catbirds; thrashers; mockingbirds. Elderberries- attractive to birds and pollinators. Berries edible to wildlife and people with restrictions. We have both the Ornamental Black Elderberry and native red elderberry volunteers. 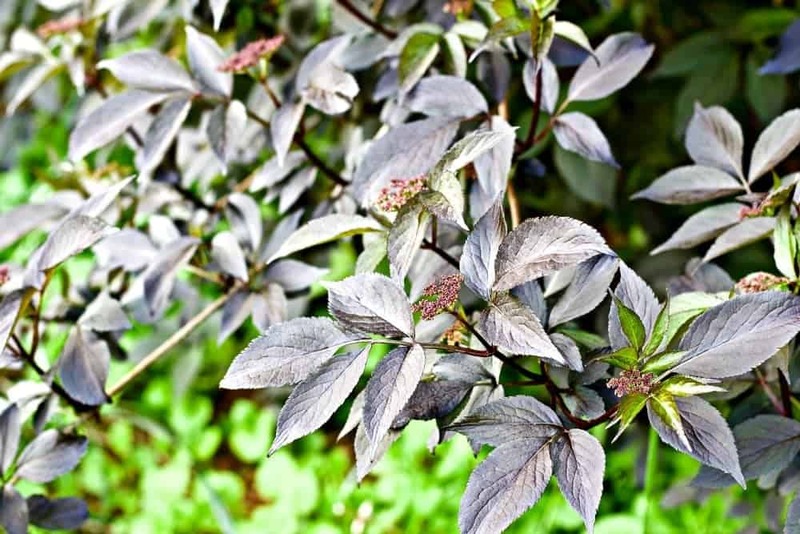 Red Elderberries produce umbrella-shaped clusters of attractive white flowers 8-10 inches wide that have vitamins A and B and more vitamin C than oranges. Berries: The purple berries ripen in mid-late summer and September. Attracts: Warblers; orioles; tanagers; catbirds; thrashers; mockingbirds; waxwings. With more than 150 species, viburnums are one of America’s most popular flowering landscape shrubs. They grow in a wide range of temperatures in USDA zones 2-9, and there is a variety to tolerate virtually any garden condition: wet or dry, sun or shade, natural or formal. Grow as: Shrub or tree. Blooms: Early spring through June. Berries: Red, yellow, blue or black berries appear in fall. Some last through the winter. Attracts: Robins, bluebirds, thrushes, catbirds, cardinals, finches, waxwings, others. There are MANY other bushes and trees that will attract and support birds to your garden. Just be sure you want those bushes. Some are very invasive. 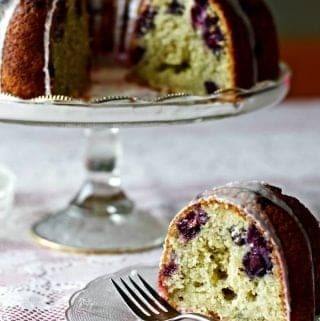 Like our blackberries! Birds will eat and drop the seeds and berries of their favorite foods wherever they fly. BONUS CHOICE: One more REALLY important family of shrubs and trees to consider for your home garden is the Junipers! Birds need the shelter and berries they provide to get through winter months. Thank you for such a valuable list. I’m always interested in attracting birds and supporting them. I have discovered that many species of birds love the berries of Mahonia Holly. I have one in my backyard and have constant activity when the berries are ripe! I will always have a Mahonia for this reason. Thanks for another great post! Hi Sally, I’m delighted this post was valuable to you. Thank you for adding Mahona! What a great addition to our list! Angie my eyes were opened when I started researching this post. I learned a lot including that I need to focus on bushes that will help our local birds get through the winter. Elderberry is a great choice. Thanks for the visit! The older I get, the more I enjoy watching birds play in the garden – bushes, birdbaths, and feeders, it’s all good. 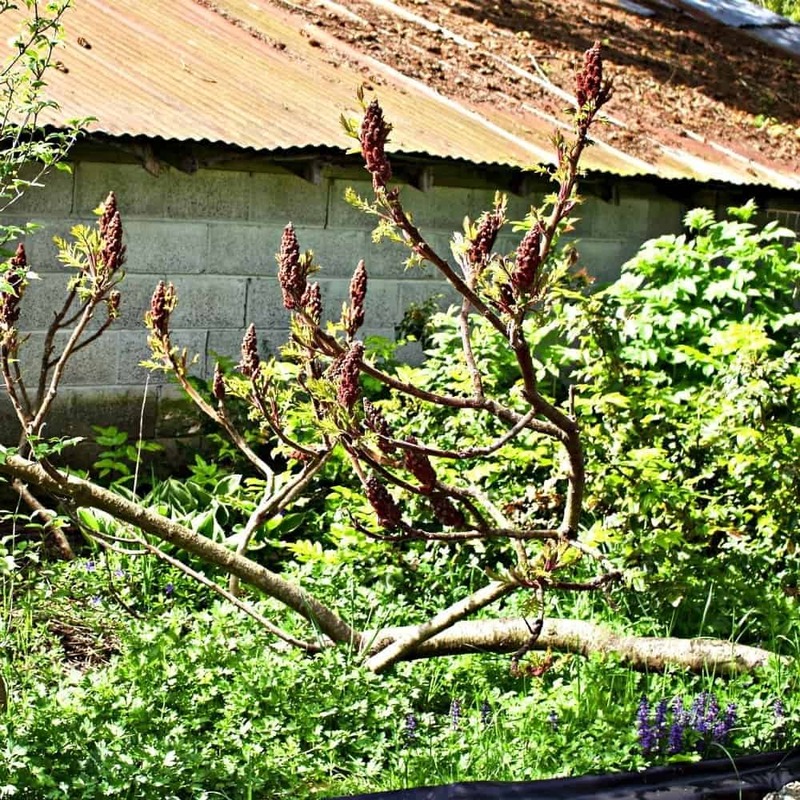 🙂 You’ve included some of my favs, but I’ve never grown the staghorn sumac – how interesting!! We had Dogwood trees and they attract the waxwings each fall. There are hundreds of those beautiful birds that come to feast on the berries. It’s so fun to watch them. We put out feeders for the birds and we have two bird baths and a fountain too to keep them happy. We love to sit and watch the birds. Gosh Shelly, I want to visit your yard! It sounds like you have a good birdscape going. I’m looking forward to getting more birds to come into the yard. They tend to stay up in our tall trees where they feel safe. We love watching the birds and have several feeder and suet cages on our property. The other day I noticed a nest in a cypress I was trimming with robins eggs (I think) in it. Right next to the front door. I think I need to purchase a new shrub just for the birds. I have my eye on a pretty red twig dogwood too. Thanks for sharing this important information. I have never set out feeders for the birds. We have always had cats until this year. Now I think a feeder will be a part of my new landscape design. I really love our red twig dogwood Patti.Thanks for stopping by and enjoy Hawaii!